Oaxacan food is one of the joys of living in LA! Famously rich and diverse, this cuisine is full of rich, robust flavors, and famous for complex and delicious sauces. A Oaxacan fried of mine introduced me to the delicious sauce in this recipe and I knew I had to make it! 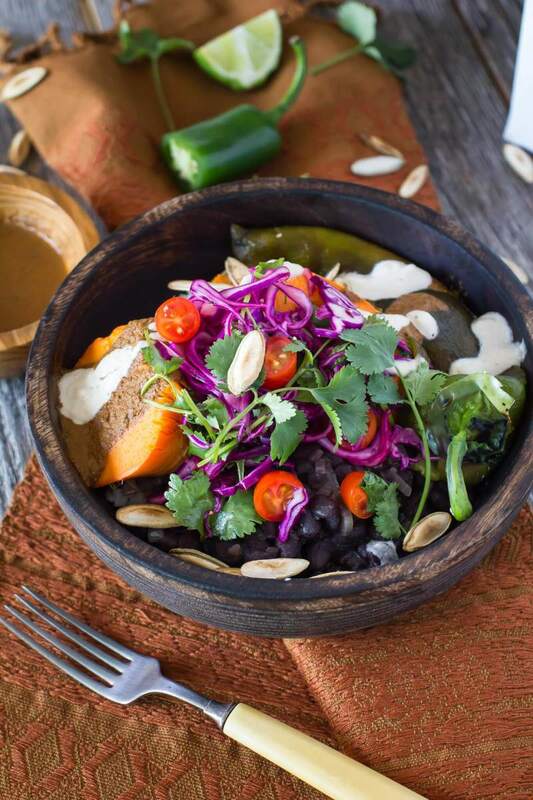 Guajina sauce is a regional specialty made from just 3 simple but signature ingredients-pepitas (or pumpkin seeds), chile and avocado leaves. Not just any avocado leaves! Mexican avocado leaves are not toxic like some other varieties and have a unique licorice like flavor. You can find them online here. Black beans are another ingredient very common in Oaxacan cuisine and these are very simply prepared with just onion and garlic! 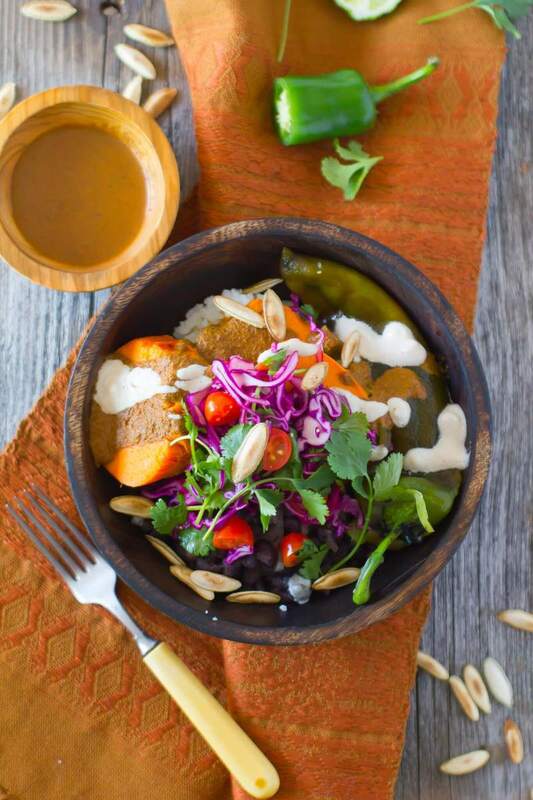 This bowl is delicious and with any seasonal vegetables, but sweet potato is a perfect complement to the earthy and mildly spicy sauce. Place the rice in medium bowl and add enough water to cover by 2 inches. Using your hands, gently swish the grains to release any excess starch. Carefully pour off the water, leaving the rice in the bowl. Repeat four times, or until the water runs almost clear. Using a fine mesh strainer, drain the rice. In a medium pot, bring the water, butter, salt, and rice to a boil. Cover the pot with a tight fitting lid, then turn the heat down to a simmer and cook for 15-20 minutes, until all of the water is absorbed and the rice is tender. If the rice is still too firm, add a few more tablespoons of water and continue cooking for a few minutes more. Place beans in a large pot and add water until beans are submerged by 3 to 4 inches. Add the garlic and onion. Cover and place over high heat until water comes to a boil, then uncover pot and reduce heat to a bare simmer. Cook until beans are completely tender and creamy, 1 to 2 hours, stirring occasionally, and adding water if tops of beans become exposed. Remove onion halves. Increase heat to medium and simmer, stirring frequently, until reduced to a thick, creamy sauce that clings to the beans, about 10 minutes. Season to taste with salt. Serve over rice or as a side with fresh cilantro and a dash or two of hot sauce. If you have a gas range, place the whole poblano directly on top of the open flame and allow to cook until the skin turns completely black. You will need to use tongs to turn the poblanos so you can evenly blacken all sides of the chile. Make sure to have the ventilation turned on above your stove to take away any fumes! When the chiles are blackened, remove them from the stove and allow to cool. Once cool enough to touch, carefully peel away the black skin, being careful not to tear the chile. Once the skin is clean, carefully cut along the length of the chile and remove the inner seeds. Try to keep the stem on the chile for a nice presentation. Set aside cleaned and seeded chiles until ready to serve. Oil a small sheet pan and place the whole sweet potatoes on it. Place the sheet tray in the center of the oven and allow to bake for 40-50 minutes, or until fork tender. When slightly cooled, remove the skin from the sweet potatoes and slice. These can be made ahead of time and simply re-heated before serving. In a mixing bowl, toss the shredded cabbage and cilantro with the agave, lime juice and sea salt shortly before serving. Blend cashew ingredients until smooth in a blender. Toast the avocado leaves in a hot, dry skillet or heated comal, pressing lightly with a spatula, or, using tongs, pass them over a live flame for about 10 seconds. Toasting heats up the natural oils in the leaves and brings out the licorice flavor. For this reason it is best only to toast what you will use in a particular recipe, toasting afresh for each use. Set your oven at 350°F. Toast the pumpkin seeds in a sheet pan for 5-10 minutes or until lightly toasted. Place the pepitas, guajillo chile, avocado leaves, water and salt in a blender, and puree until smooth. *Oaxacan avocado leaves are available in specialty latin markets, but may not be available in your area. Mexican cuisine expert Rick Bayless has suggested a combination of bay leaves and cracked anise seed as a substitute for avocado leaves. 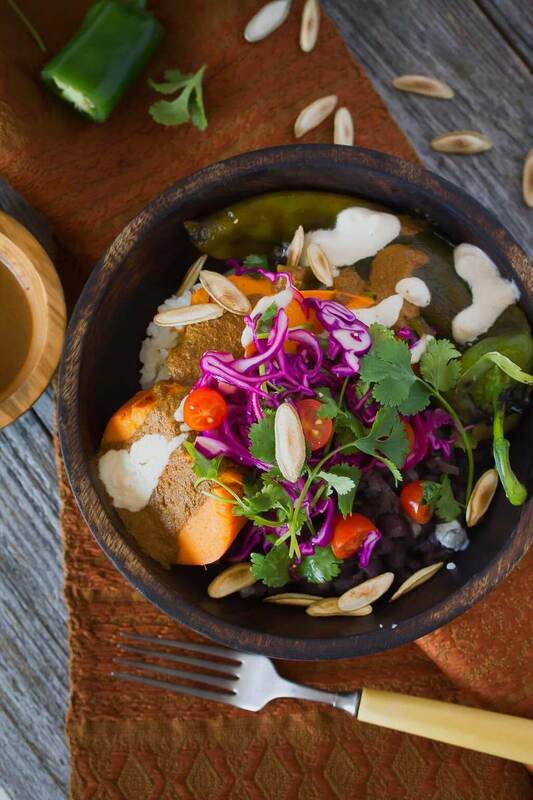 To assemble the bowl, place some of the rice and black beans in the bottom of a bowl. Top with some of the roasted sweet potato, 1 or 2 whole roasted poblano, and a few tablespoons cashew crema and guajina sauce. Top with cabbage slaw and a few more roasted pepitas as garnish if desired. If you have some cherry tomatoes, these make a wonderful topping as well!